Yesterday, I had no plans to make a grilled cheese. No plans to buy any special cheeses. No plans to make a special grilled cheese sandwich. That was until I stopped at Heinen’s to pick up some bagels so I could have an egg/cheese/bagel sandwich for lunch. In their cheese department, they had Beemster cheese on sale. Since I had never tried Beemster, I thought why not use that on my sandwich and post about it? It was a good idea until I found the gentleman giving out samples. When it comes to samples, as long as I know I can eat it, I try it. C’mon, who doesn’t love free food?! This sample included little square toasts with some sort of whipped goat cheese spread and fresh snipped chives. I tried it and was pretty intrigued. The spread turned out to be Chevremousse, or all natural whipped goat cheese, nothing that I had ever seen before. However, I almost still went with the Beemster cheese…until I started talking to the cheese lady and sample guy. They said they had just gotten in the Chevremousse (whipped goat cheese) and both were intrigued with its taste and possibilities. I couldn’t have been happier with my decision. 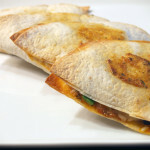 The texture is soft and creamy and the goat cheese flavor is unreal. It is hard to describe and I suggest you try it for yourself to get the full, amazing effect. 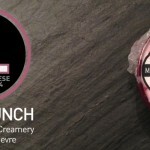 Chevremousse is like an unreal cream cheese that was delivered from heaven. 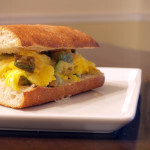 When I arrived home, I still had plans of making my egg/cheese/bagel [grilled cheese] sandwich. 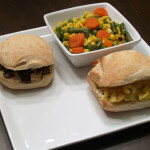 It just seemed like the Chevremousse would fit perfectly in this particular sandwich. Plus, I had fresh chives in our backyard garden. 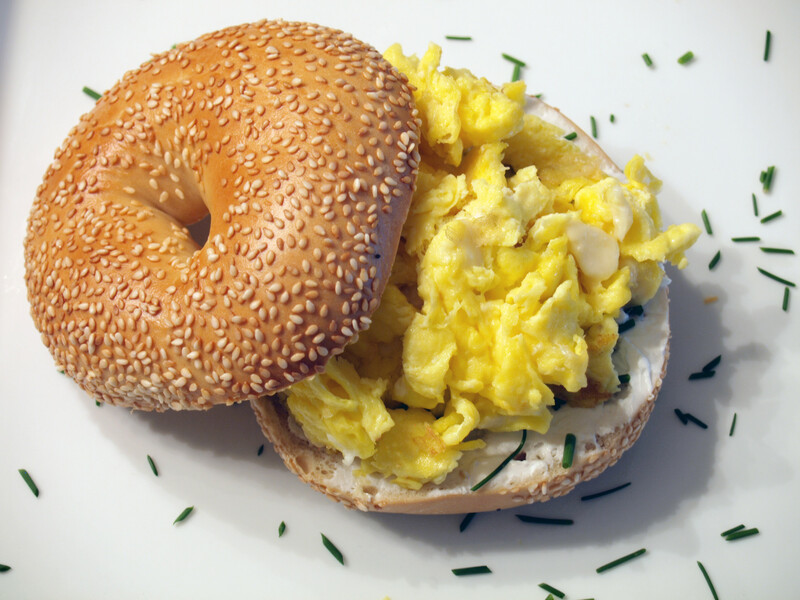 I lightly toasted the bagel while I also made my scrambled eggs. Since I am a huge fan of putting cheese in my eggs, I used some leftover Genuine Pecorino Romano Fulvi from my previous grilled cheese. Once the bagel was toasted, I spread on a thick layer of the Chevremousse, I wanted to taste it, and then as you can see above, added a great amount of snipped chives. 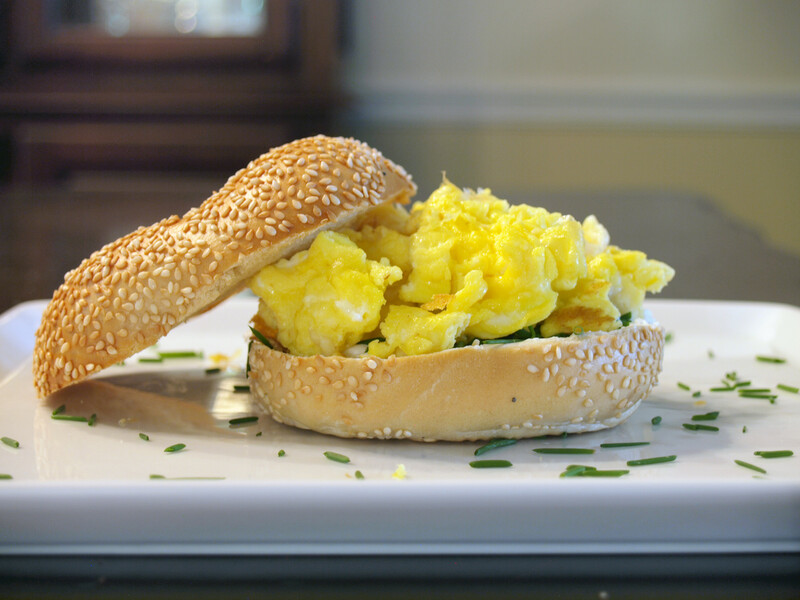 Finally, I added the freshly scrambled eggs and the top half of the bagel. This basic grilled cheese, featuring a new cheese I had just discovered, was absolutely phenomenal. 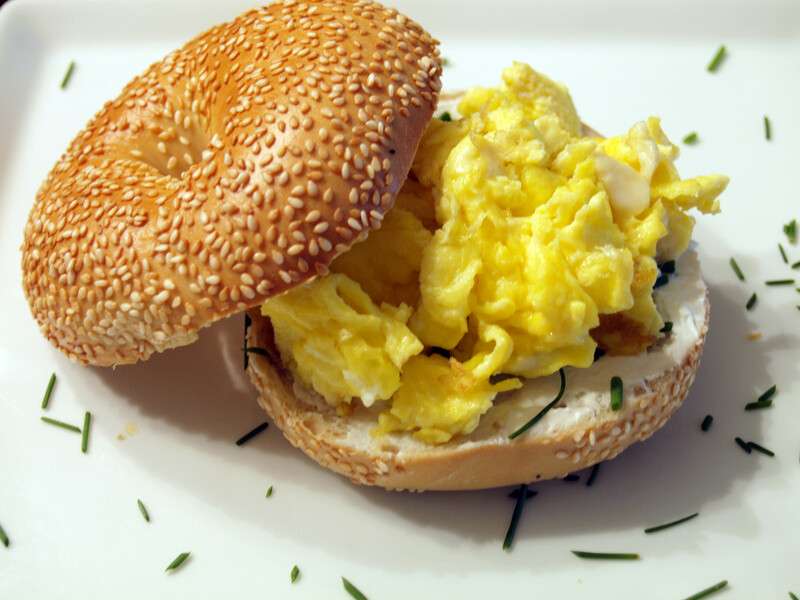 By placing a thick layer of the Chevremousse (whipped goat cheese) on the bottom half of the bagel, I was able to combine the flavors of the cheese, chives and eggs plus the crunchy texture of the bagel. 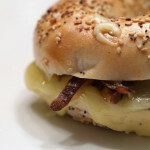 The “clean and sweet” flavor of the Chevremousse was simply perfect on the bagel. I savored each bite of this grilled cheese and plan to eat the Chevremousse on just about anything in this house. Sure, a small container is not cheap, but it is well worth whatever you pay for it. Posted in Grilled Cheese and tagged bagel, chevre, chevremousse, chives, scrambled eggs.